Also known as Pituitary Pars Intermedia Dysfunction or PPID, Cushing’s Disease is a dysfunction of the pituitary gland. 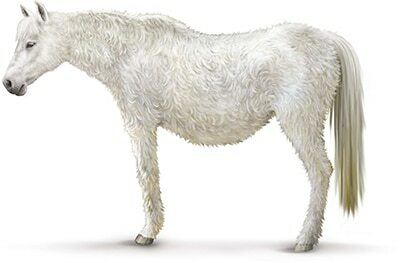 It is most common in older horses (18 – 23 years). Since it is sometimes associated with Insulin Resistance, Cushing’s can be confused with another condition called Equine Metabolic Syndrome. For more information on Equine Metabolic Syndrome, click here. Products with these and other ingredients that may provide complementary support to prescription medications for this condition can be found on our Equine Pituitary Health Supplements page. After a complete physical examination and routine bloodwork (CBC and serum chemistry), your veterinarian has a few options for specifically diagnosing Cushing’s. These include measuring the resting ACTH level, performing a TRH Stimulation Test, and others. Prascend® is the first and only FDA-approved product for the management of Cushing’s in horses. It contains the active ingredient pergolide. Because insulin and blood sugar metabolism may not be functioning properly in Cushing’s horses, avoid feeding traditional grains, treats or pasture because these can be high in sugars and starches. Instead, meet the horse’s nutrient requirements with a multi-vitamin/mineral supplement or low-sugar/high-fiber feed made especially for senior horses. Add fat for additional calories, if needed. An older horse with Cushing’s is truly a “special needs” horse. Cushing’s often compromises the immune system, causing horses with this condition to be more prone to infections and other health problems. Because of this, Cushing’s horses should be seen by a veterinarian at least twice per year with special attention paid to vaccinations, deworming, dental health, hoof care, and other preventive maintenance. How is Cushing’s Disease different from Equine Metabolic Syndrome and Insulin Resistance? Is Cushing’s Disease the same thing as diabetes?